← Schoop Schoop Ooh Wee! Just when I thought Fight Nights were on hold and only to be accompanied by Samsung and Singha I found myself at the Scala last Sunday evening in a very British setting. Now, last time at was at this venue I’d been one of a few girls surrounded by dozens of barely-clad writhing men. Popstarz is long gone, but I was still one of a few girls surrounded by dozens of barely clad writhing men. This time, however, rather than gay boy night it was fight night for a load of different gyms across London. The testosterone ran high. The smell of boxing liniment hung in the air even as I approached from outside the venue. It’s a smell I actually miss. Between work, the city, flatselling and other commitment I haven’t been able to be as motivated as I would have liked when it comes to training. For the last few weeks I’ve been managing to get up four times a week at 6.30am to run, work on my business or just focus on things to be done, but my motivation since returning from Thailand full of vitamin D, has been slipping, so it was great to be inspired and watch some real fighters for an afternoon. And so seeing some good (and not so good) one to one Muay Thai has encouraged me again to set my alarm for 6.30 starts. It’s definitely easier to keep up the motivation when the weather’s good, and it’s definitely easier when all around is going smoothly, however it’s the inbetween bits that are hard. But on the whole, it’s not a bad place to train though certainly doesn’t have any of the ‘saba sabai’ thai style and grace that Kob and his team teach. The gym is pretty much split into areas – the usual types of cardio machines overseen by said DJ, and a free weights area loved by walking brick houses. Then there’s the studio – where classes included Pilates and yoga are held attended by willowy women wearing lots of make-up. The Ring is my favourite area. It’s a concrete room lined with mirrors and hanging bags, tied bags, a cage (yes you guessed it) and the ring itself…It was from this last area that I recognised some of the people at last Sunday’s fight night. Two by two the fighters entered the ring under the glare of fluorescent lights and the MC introduced them by class by name and by weight. 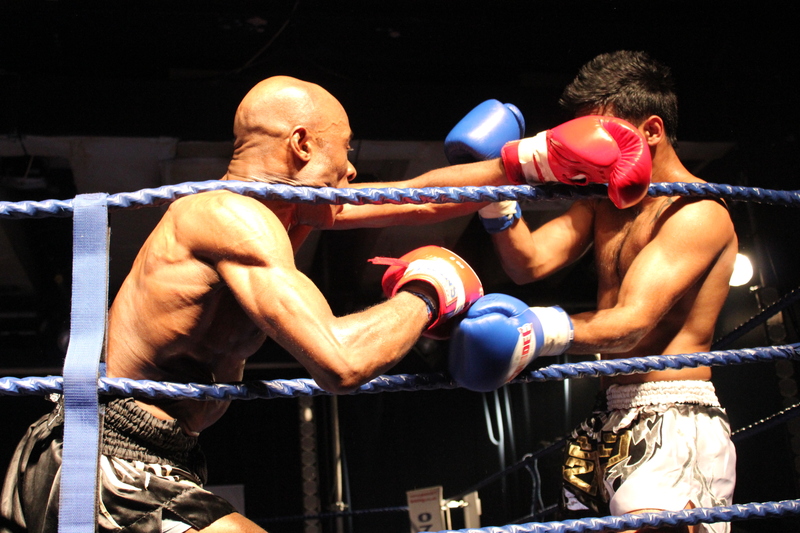 I only saw a few of the fights and both boys from Gymbox won – the first with a knockout barely 1 minute in and the second after 4 valiant rounds. And so, my main reason for going was to see if watching these fights would help my motivation levels. I’m not managing quite as much training as I would like – I’ve realised that to keep up my current levels of activity, I need to find 86 hours over the next 2 months just to train. So that’s not just a time challenge it’s a motivational one. I had planned a session every day from Monday to Friday, sadly though unsurprisingly after burning the candle at both ends I’m sick, which has put paid to training for a couple of days. I’m still keenly aware that you can’t do great things on your own so I’m building up my support networks of people, places and things to keep me inspired. So thanks to all of you keeping me on track right now – whilst I’m still inspired, my energy levels aren’t quite up to the fight right now. So for now, I’ll just watch others in the ring til I’m ready to get back in. This entry was posted in motivation, muay thai. Bookmark the permalink.